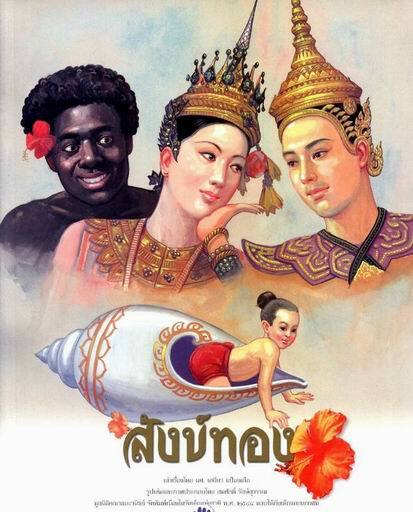 Sang Thong is a very popular folktale in Thailand and it is maybe the most well-known tale among Thai people. 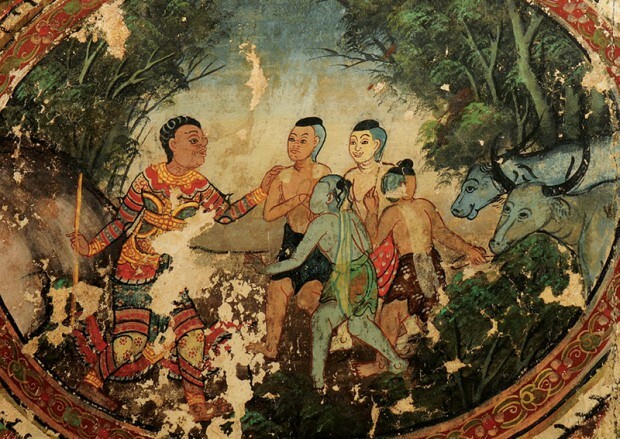 It has been transmitted in various forms ranging from jataka tale, written literature, folk drama, local legend to television drama. 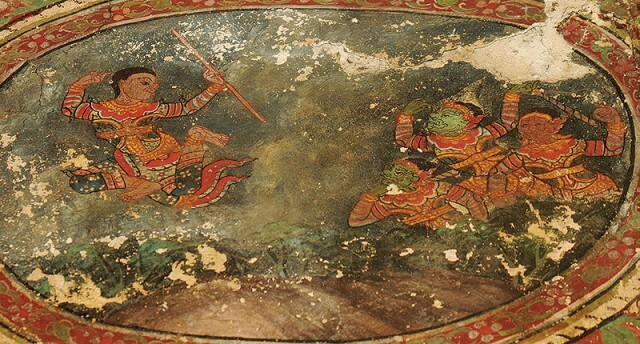 The first written version is Suwan Sangkha Chadok in Panyasa Chadok (Suvannasankhajātaka, Jataka Tale). Thus, today I’d like to retell this story for you. Once there was a king who had two wives. When his major wife gave birth to a son, this son was born in a conch shell. The minor wife wanted to banish the major wife and her son from the kingdom and she was successful. The king ordered the major wife and his son, Prince Sang, to live in another place with an old couple. Each day, Prince Sang would leave his shell to work in the household of the couple. When his mother learned about this, she broke his shell. Still the minor wife longed to get rid of the Prince. Thus, he found harbour at the place of a giant lady who took care of him. The giant lady forbade the Prince to jump into the golden well but one day the Prince broke this rule. He jumped into the well putting on an ugly mask to escape. When he wore his ugly dark mask he was called Chao Ngo. This was when he came across the Samon kingdom. The king of Samon had seven daughters. Hence, he ordered all kings to send their sons to his place so that his daughters could choose their husbands. Six of the king’s daughters chose a husband but only his youngest daughter Rodjana did not. To the king’s surprise and anger, she finally took Prince Sang as her husband. 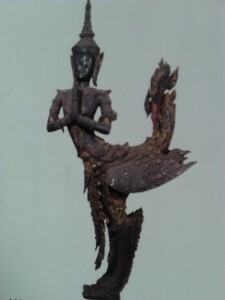 She was the only one who could see his golden body whereas to other people the prince appeared as an ugly dark person. 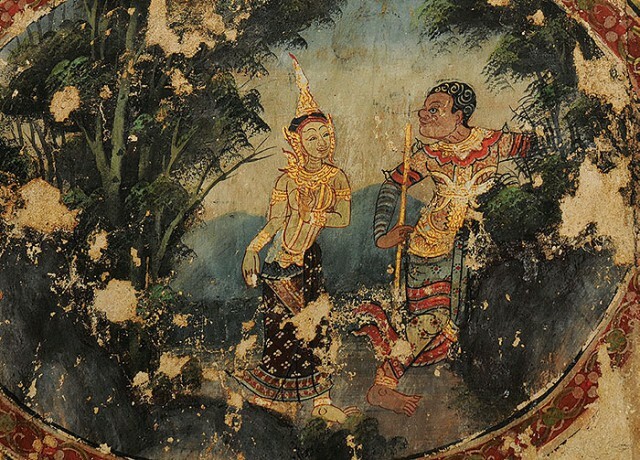 Enraged, the King chased his youngest daughter and her ugly husband away to live in a rice field. Hence, the king also ordered his other sons-in-law to bring him a 100 fish and deer. He wanted to see Chao Ngo dead. However, Chao Ngo was clever and could perform magic. Thus, he was the only son-in-law able to bring the king what he wanted. Finally, Chao Ngo was the only one who could help King Samon to protect and save the kingdom. This was when his golden body and his royal origin were revealed. Summing up, we can say that Sang Thong is a hero who becomes finally accepted. At first he hides behind ugliness and deformation but then his true nature and beauty is revealed. 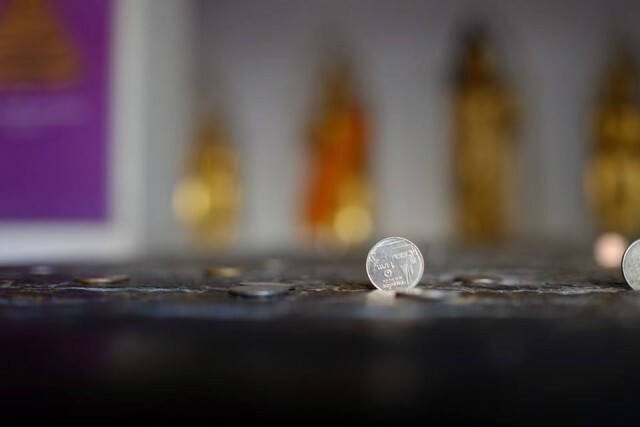 2 grams weights the world’s smallest mammal. 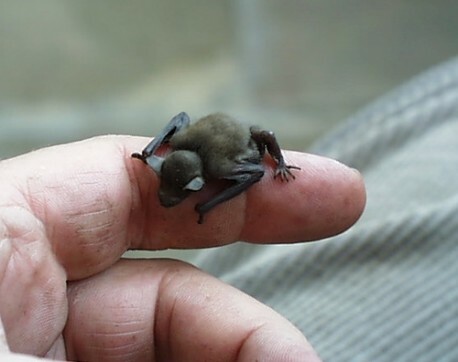 It is the Kitti’s Hog-nosed bat which is also known as the bumblebee bat. It is a vulnerable and rare species of bat and the only extant member of the family Craseonycteridae. 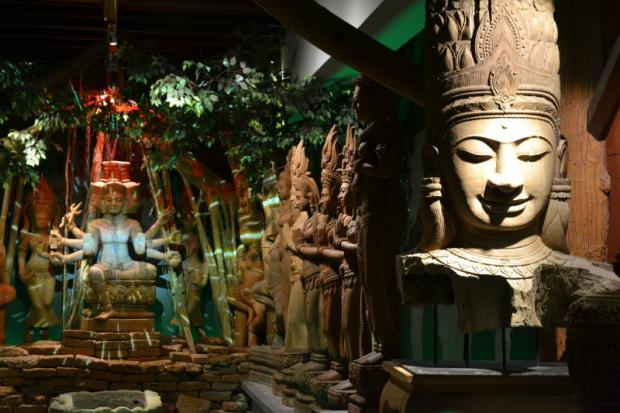 It occurs in Western Thailand in the Kanchanaburi province, more specifically in the Sai Yok National Park, where it occupies limestone caves along rivers. 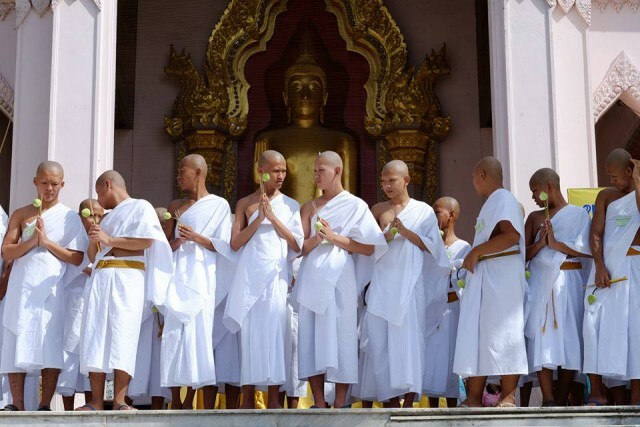 95% of all Thai people are Buddhists. 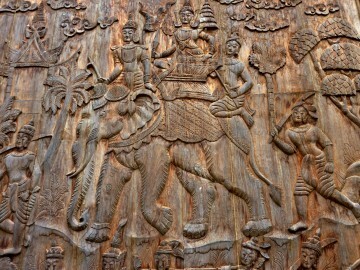 Thai tradition supports laymen to go into a monastery for a certain time period. This retreat is expected of all male Thais and is commonly scheduled after high school. Such retreat brings honour to the family and merit to the young man. 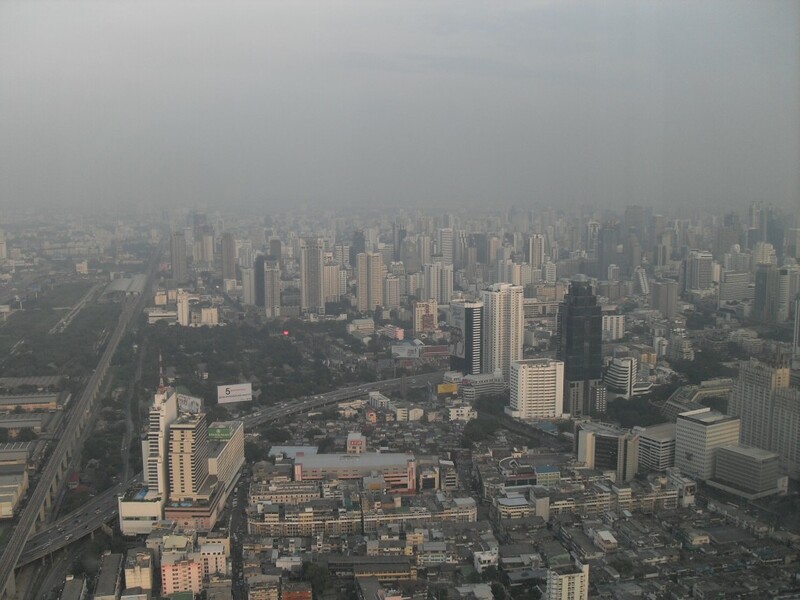 169 letters has the official name of the capital Bangkok: It is known to Thais as Krung Thep Maha Nakho, but its full ceremonial name is Krungthepmahanakhon Amonrattanakosin Mahintharayutthaya Mahadilokphop Noppharatratchathaniburirom Udomratchaniwetmahasathan Amonphimanawatansathit Sakkathattiyawitsanukamprasit. 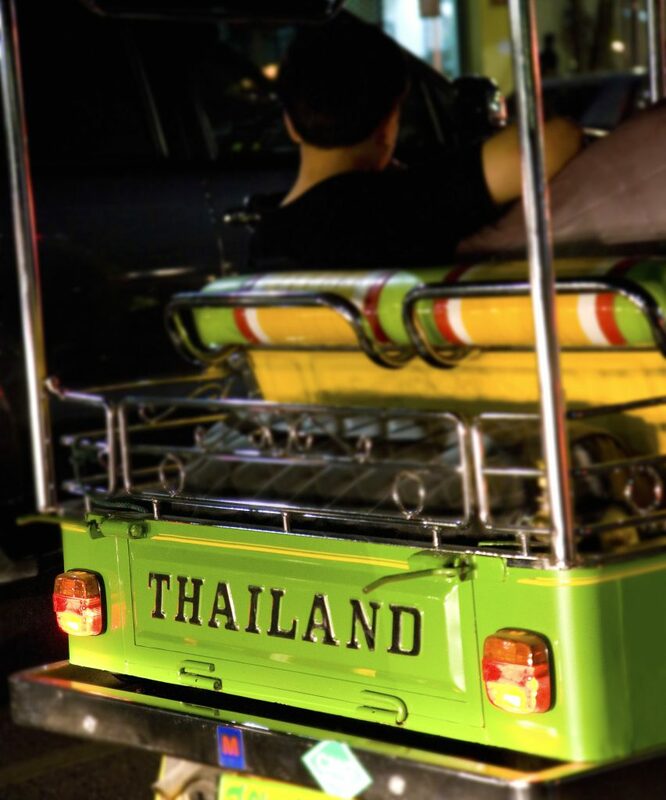 70% of all animal and bird species are living in Thailand. Thus, Thailand is one of the world’s countries richest in species. 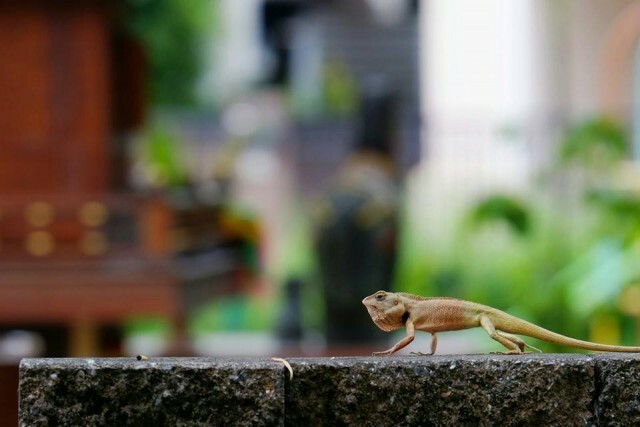 There are over 200 different reptiles living in Thailand according to Thai National Park’s ‘List of reptiles’. 172 meters high is the world tallest stupa. 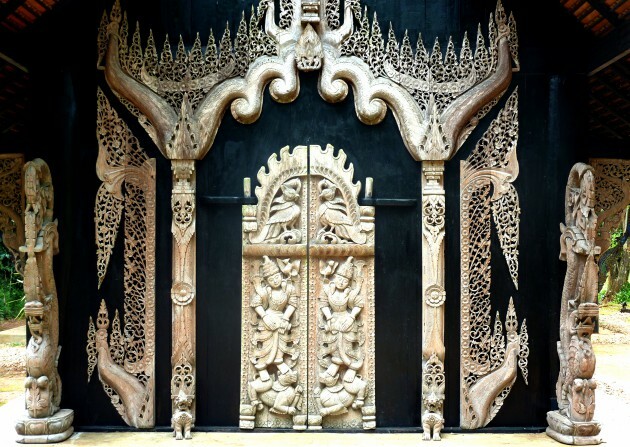 It is located in Nakhom Pathom and called Phra Pathom Chedi. 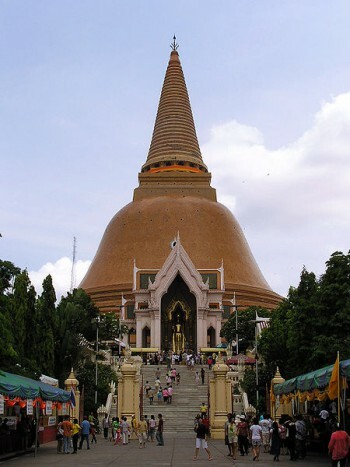 It was completed in 1870 and the name Phra Pathom Chedi means ‘the first holy stupa’. 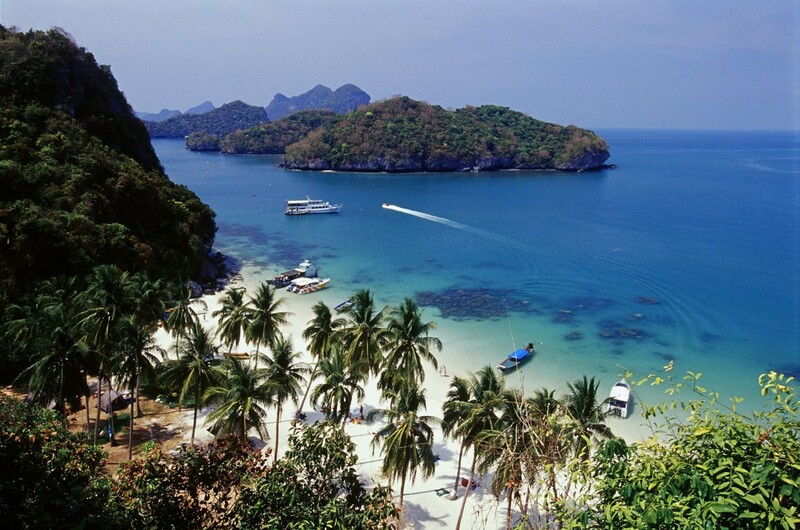 1430 islands are there in Thailand, ranging from desert islands to spectacular islands. Some are well-known and popular among tourists while others are still pristine. 1586 meters long was the catwalk of the Pattaya International Fashion Week in 2010. Thus, it was a Guinness World Record in Pattaya. 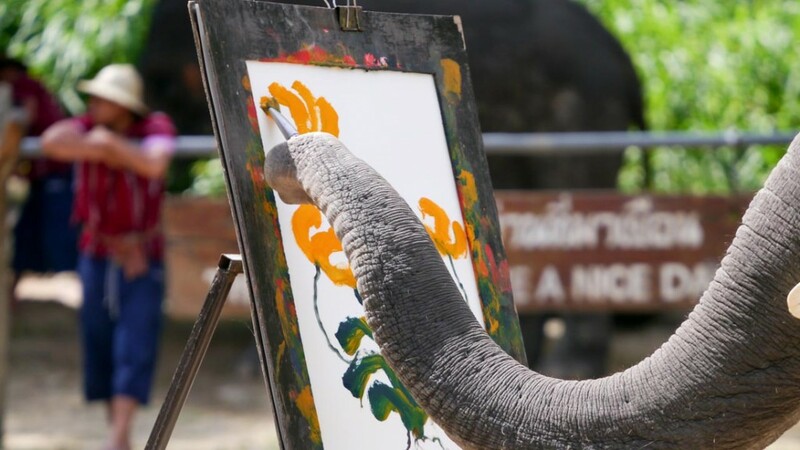 1,500,000 Bath (around 37.000 Euro) was paid for a painting created by eight elephants from the Maesa Elephant Camp in Chiang Mai. 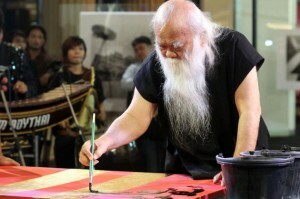 The painting measured 2,4 x 8 meters. 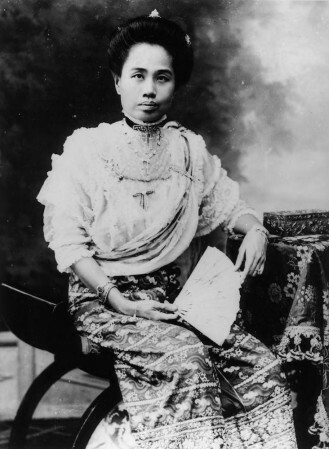 Dara Rasami (in Thai: ดารารัศมี, also spelled ‘Rasmi’), born in 1873, was a Princess of Chiang Mai and a descendent from the Chet Ton Dynasty. 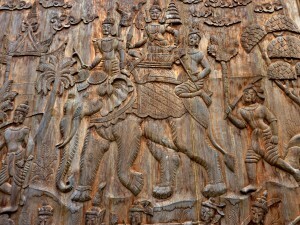 Her parents were King Inthawichayanon and Queen Thipkraisorn Rajadevi of Chiang Mai. Dara Rasmi Na Chiang Mai, as she was officially called, became a princess consort of Siam by marrying King Chulalongkorn (Rama V of Siam). They had an only daughter called Vimolnaka Nabisi who, however, died at the young age of only 2 years 8 months. Later, the Princess was promoted to the rank of High Queen ‘Chao Chom Manda Dara Rasami’. King Chulalongkorn’s marriage to the Princess of Chiang Mai was mainly a strategic alliance. In the 1860s and 70s Siam became increasingly concerned that the British might colonize the Kingdom of Chiang Mai since they had already taken neighbouring Burma. In addition, there was also a rumour that Queen Victoria intended to adopt Princess Dara. 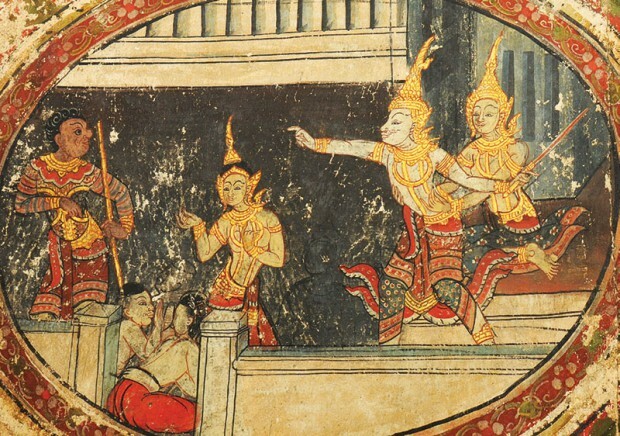 Hence, the Siamese court became alarmed that the British wanted to take over Lanna. 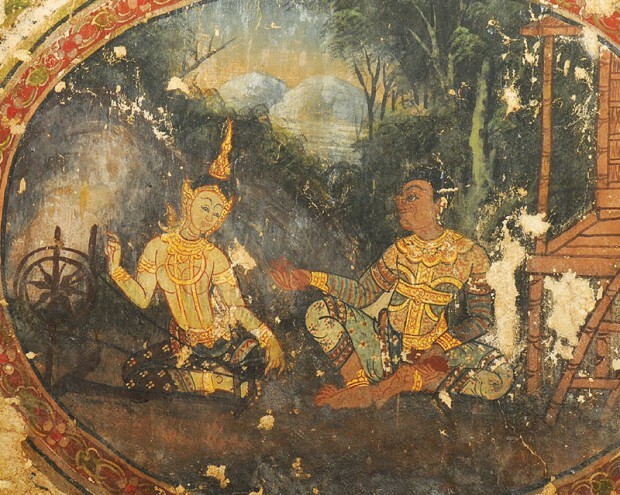 Consequently, the King’s brother, Prince Phichit Prichakorn, was sent to Chiang Mai to forward the King’s proposal to the princess. 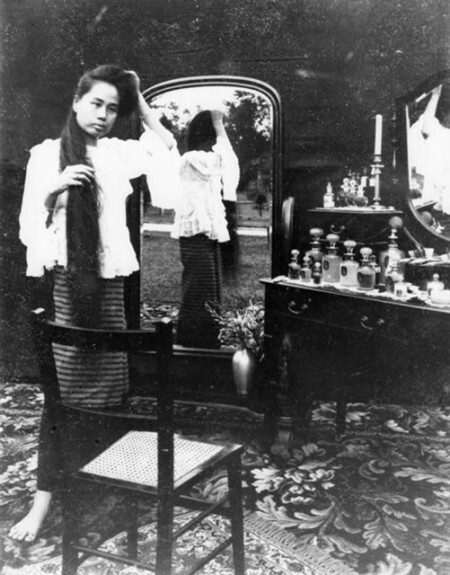 In 1886, Dara became a concubine to the King, entering the Siamese Royal Court. However, the princess who came from Chiang Mai was not really accepted at the Grand Palace but rather disparagingly referred to as a ‘Lao Lady’. She and her retinue were also teased that they ‘smelled of fermented fish’. Nonetheless, Dara and the ladies in her entourage were not to be deterred by these circumstances. In fact, they stuck to their northern style clothing and long hair. Thus, they did not adapt their appearance to the fashion of the Siamese court where the ladies wore short hairstyles at that time. 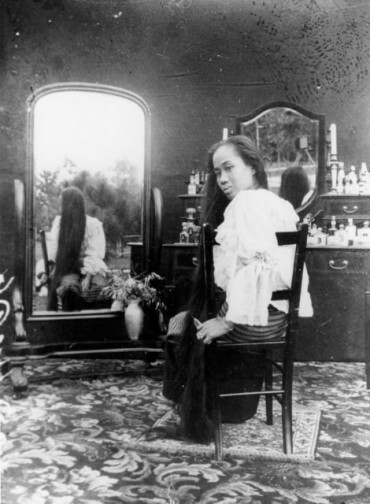 As a matter of fact, Dara’s appearance, her way of clothing and her extremely long hair, differed greatly from that of the Siamese ladies at the court. Thus, her ‘foreignness’ or ‘exotic appeal’ is strikingly on display in a series of photographs taken by Erb Bunnag who was also a royal consort. 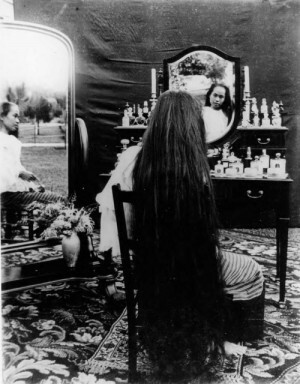 Dara is portrayed in front of a dressing table and mirrors which evoke an atmosphere of intimacy. The viewer gets the impression that he is in the private sphere of the princess. It is also interesting to note that Dara’s face is often reflected in the different mirrors and thus seen from different angles, a fact that she did not seem to be aware of. 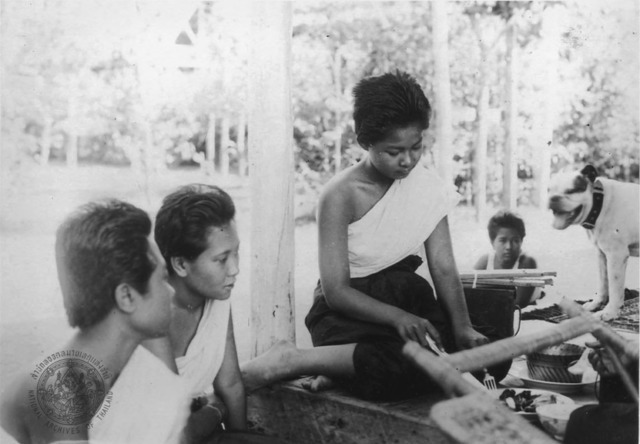 These photographs stress the ‘foreignness’ of the princess and point out that she is different and does not really fit into ‘the otherwise ethnically homogenous environment of the Siamese royal court’ (Leslie Woodhouse). It is primarily her amazingly long hair that signals Dara’s ethnic distinction from the Siamese ladies. This fact is particularly on display in these photos. In a broader sense, this presentation also indicates what can be considered siwalai (‘civilized’), adjusted and what not. In other words, Dara is presented as feminine, however, her way of dressing and styling does not seem to be in accordance with Siamese ‘siwalai’ standards. Thus, it is hinted at her ethnic inferiority. Nevertheless, she stayed more than two decades at the court but a few years after King Chulalongkorn’s death in 1910, Dara asked King Rama VI for permission to go to Chiang Mai for retirement. 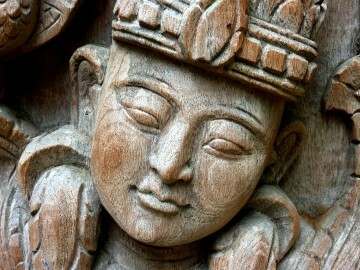 Her wish was granted and she returned to her hometown in 1914 where she continued her royal duties to the Lanna people. She died at the age of 60 in 1933. Here is a video clip summing up the most important stages in Princess Dara’s life. Finally, we may say that Princess Dara Rasami can be considered a ‘foreign’ and ‘other’ concubine at the Siamese Royal Court. 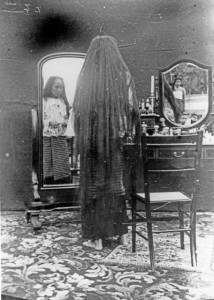 In fact, she had the status of ethnic inferiority which is also displayed in contemporary photographs.